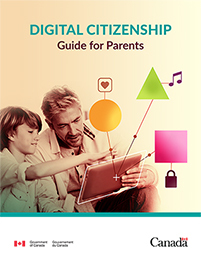 The Digital Citizenship Guide for Parents is designed to prepare parents and guardians for the conversations they should have with their children when they first start using digital devices. Respecting People’s Feelings: covers topics such as “drama”, cyberbullying, healthy romantic relationships, and how to be a positive influence online. Respecting Privacy: conveys the importance of protecting your child’s privacy online and how to help your child be safe and secure while social networking online. Respecting Property: provides information on serious matters, like illegal downloading, plagiarism, and how to access legitimate content. It also provides conversation starters on a variety of different topics to help parents talk about these issues with their kids in a constructive and meaningful way, and offers tips for creating household Internet rules. This guide was prepared by Public Safety Canada and MediaSmarts.